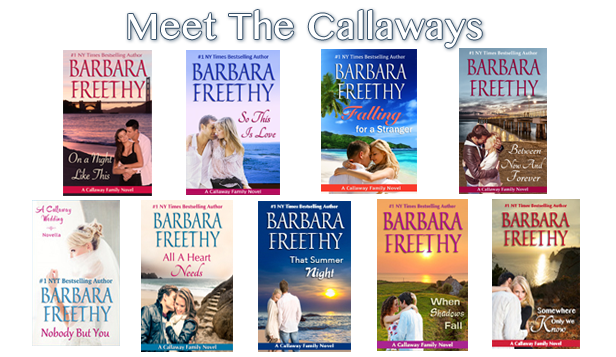 Check out this excerpt from #1 NY Times Bestselling Author Barbara Freethy’s first book in the Callaway family series… Then read on for more information about this blog tour and all its great prizes! “Not that I ever really had one,” she countered, surprising herself a little with the words. She was used to holding her tongue when it came to her dad, because talking usually made things worse. A tickle caught at her throat and her eyes blurred with unwanted tears. She had not come here to cry. She sniffed, wondering why the air felt so thick. It took a minute to register that it was not her emotions that were making her eyes water, but smoke. She was on her dad’s heels when he entered the kitchen. The scene was unbelievable. Flames shot two feet in the air off a sizzling pot on the stove. The fire had found more fuel in a stack of newspapers on the counter that had been left too close to the burner, those sparks leaping to the nearby curtains. “Move aside,” her dad shouted, grabbing two hot pads. “What are you doing?” she asked in confusion. “Get out, Sara,” he said forcefully, then ran into the adjacent laundry room. “I have to get something important,” he yelled back at her. “Dad. We need to get out of the house.” She coughed out the words, but she might as well have remained silent because her dad had vanished through the laundry room and down the back stairs to the basement. She couldn’t imagine what he had to get. There was nothing but gardening tools and cleaning supplies down there. Sara ran through the flames and down the stairs into the basement. A single light bulb dangled from a wire over the stairs, showing her father in a crumpled heap on the cement floor. “The kitchen is on fire. We need to get out of the house.” A glance back over her shoulder revealed smoke pouring through the open door at the top of the stairs. There was no way out of the basement without going through the kitchen. “I’ll be right back,” she promised. She ran up the stairs, shocked and terrified when she saw how much worse the fire had gotten in literally minutes. The heat was intense. She could barely breathe, and there was a wall of flames between her and the only way out. She couldn’t afford to be scared. Grabbing a towel off the top of the nearby washing machine, she covered her nose and mouth, and prepared to make a dash for it. “Aiden?” She lowered the towel from her face. 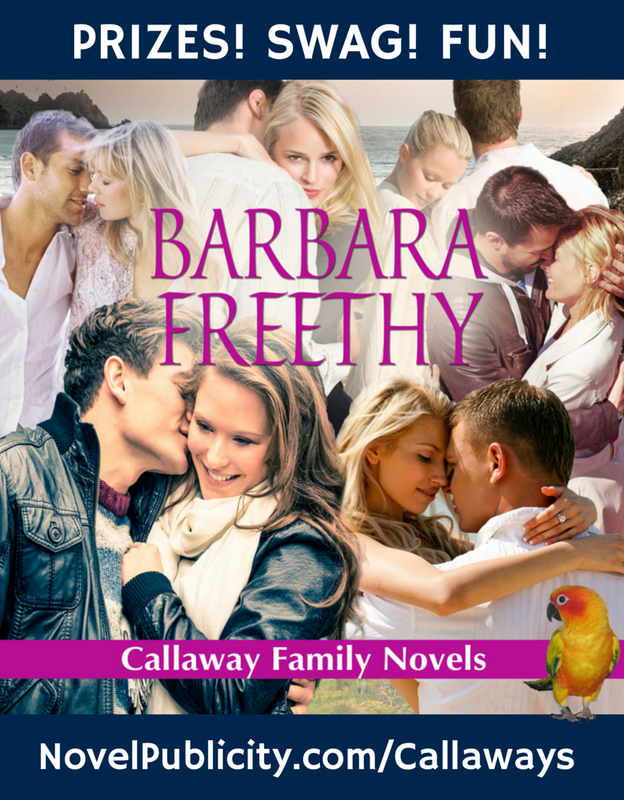 He was the last Callaway she wanted to see. 5 eBook copies to be given away. Rafflecopter runs for 3 days. Prizes awarded to winners by Jim Proctor. S.E. Meyer combines ancient alien astronaut theory, ancient Sumerian codices, current religious beliefs from around the world and the book of Revelation in a way that tears down the veil of traditional thinking to reveal new though provoking theories on the origins of the human race and its many traditional beliefs. 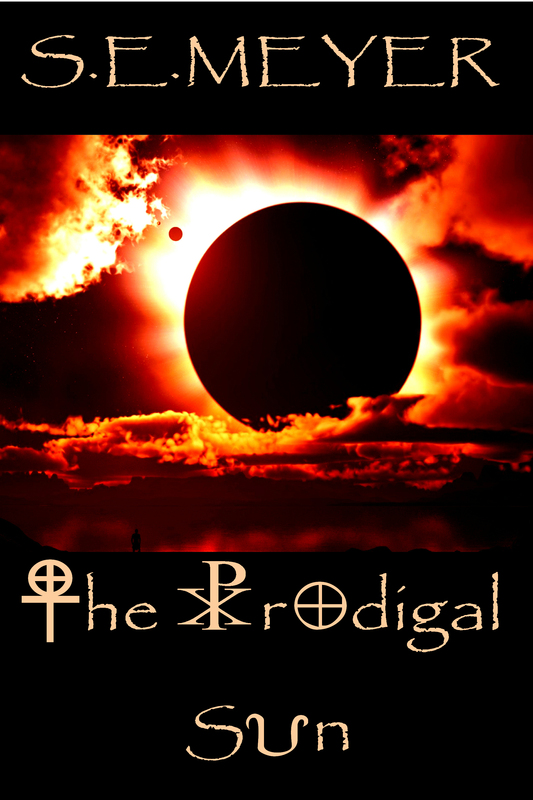 The Prodigal Sun will wow you with a fact filled, thrilling and intricately blended story that interweaves mythologies and religions in new compelling ways explored through a truly unique premise. All references to historical locations, religions, ancient writings, and the representation of current beliefs of local peoples from around the world described in this novel are true. John Mitchell’s life in the small Midwestern town of Mill City is changing forever. The animals in his lab are dying, he learns gut wrenching news about his wife, and the most important meeting of his career gets canceled when Dr. Frank Johnson mysteriously disappears. After receiving a cryptic package from the missing doctor and accidentally injecting himself with its contents, a serum made from the instructions inscribed onto a seven-thousand-year-old artifact, John discovers he has new powerful abilities, and new blood-chilling enemies. He and his wife Jenny are soon running for their lives, hunted by the terrifying figures that will stop at nothing to protect the serum’s seven-thousand-year-old secret, and retrieve the artifact needed to finish their plans. On the run and searching for answers, they are thrown into a world of ancient secrets, esoteric mysteries and a clandestine underground race, when they become trapped in a cavern that holds the shocking secret history of the Human Race, deep underneath the ancient ruins of Babylon. As millions of people around the world suddenly begin disappearing, John and Jenny learn the horrific news of the inevitable extinction of the human race. But when John discovers the hideously evil, secret motivation of the ancient race that is supposed to be saving them, he must rely on his new-found abilities to rescue the woman he loves, Earth, and the billions of tortured souls locked deep within it. Join the thousands of fans that have taken S.E. Meyer’s thrilling, fact filled, roller-coaster ride, deep into the thought provoking, controversial, yet compelling world of what we think we know to be true. What people are saying about The Prodigal Sun. In Meritropolis, everyone is assigned a numerical Score that decides their worth to society and whether they live or die. After a young boy is killed because of a low Score, his brother plots to take down the System. Sounds good, right? Well, this exciting YA Dystopia is on sale for just 99 cents Thursday, November 27 through Monday, December 1. You can pick up your copy on Amazon. To celebrate, we are offering a giveaway for an autographed copy and a $100 Amazon gift card—hooray! 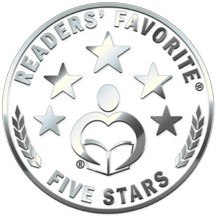 Check out this interview with Joel Ohman, the author of the book critics are calling, “The Hunger Games meets The Village with a young Jack Reacher as a protagonist”, then scroll to the end of this post to learn more about the giveaway. Happy reading, and good luck! Who or what was your inspiration to write about post-apocalyptic, dystopian sci-fi? I’ve read a lot in this genre, so I would say it’s a mix of a lot of different things. I really just wanted to explore this question of, “What gives a person worth?” Is it their usefulness to society? Is it because someone loves them? Is it because of how they look? Is it because of their health or ability? As a Christian, I believe that all people have worth, because they are made in the image of God. I wanted to explore some different takes on this question. I think that the post-apocalyptic/dystopian/sci-fi genre was the best vehicle to tackle some of those deep philosophical questions in a fun and interesting way. Why do you write? Is it for fun, or because you have something you need to say in your writing? Some writers are loath to say their writing has a message, because maybe they think doing so diminishes their art (not true, in my opinion), but I think that everyone has a message in their writing, even if they aren’t as consciously focused on it—and that’s a good thing. My message is in my epigraph: “Because everyone matters – Psalm 139”. I wanted a short one word title that was a clever—or at least semi-clever—play on two different words. I like “Meritropolis” because it combines “Merit” and “Metropolis,” two words that are great for describing a city where each resident’s worth is measured by a score given to them. 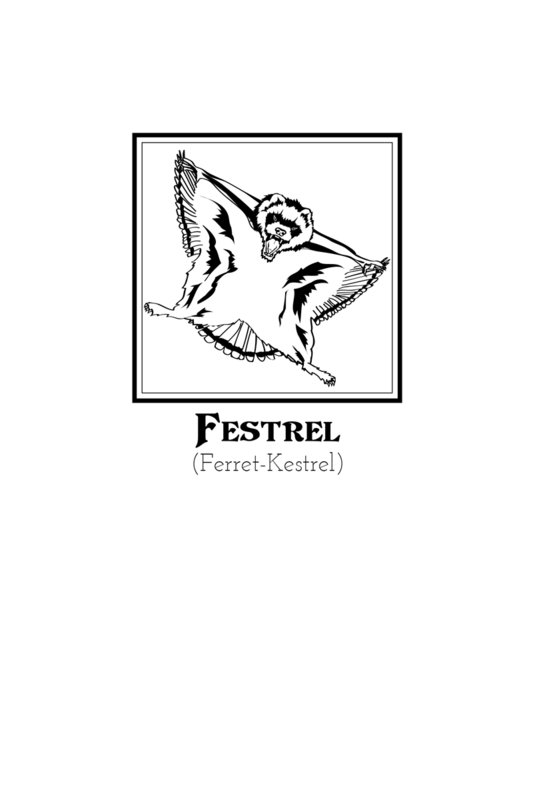 In Meritropolis, how were the animal combinations decided upon? For example, I know you chose to write about a bion (bull-lion), as well as many other freaks of nature. So what I want to know is how did you decided which animals to meld together and why. 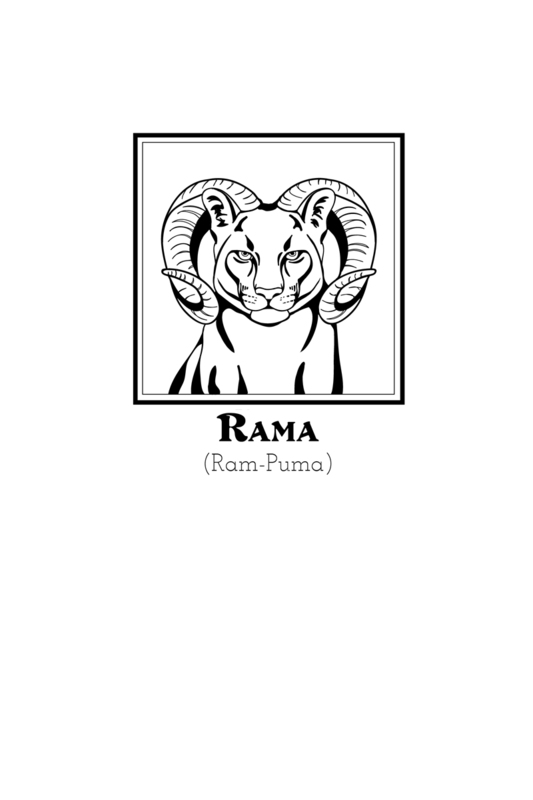 I have a big list of animal combinations that I came up with before I began writing the book, and I tried to work in as many as I could. Sometimes the only criteria was that I liked the way the name sounded. Look for many more in the following books! Can you tells us about your characters and who/what inspired them? I am a big believer in John Truby’s approach to building a “character web”, because this deepens the relationships between characters and helps to make each of the characters more complex. Absent building a good character web, it can be all too easy to fall into the not-very-true-to-real-life good-person/bad-person false dichotomy where your protagonist devolves into this I-can-do-no-wrong character and your antagonist is just pure evil. I was very much aiming to show the imperfections and brokenness in each of the characters. My thinking as a Christian influences this to some degree, given that the Bible teaches that we are all essentially the same; we are all sinners—only God is perfect. Do you have a favorite genre that you like to read? I read pretty much everything! Fiction, non-fiction, you name it! I am of the opinion that, as an author, I can learn something from almost every kind of writing. Sometimes, it most definitely is a matter of learning what not to do—but, on the whole, I love to read a wide variety of writing styles, genres, etc. Are there any books that have inspired your own writing? 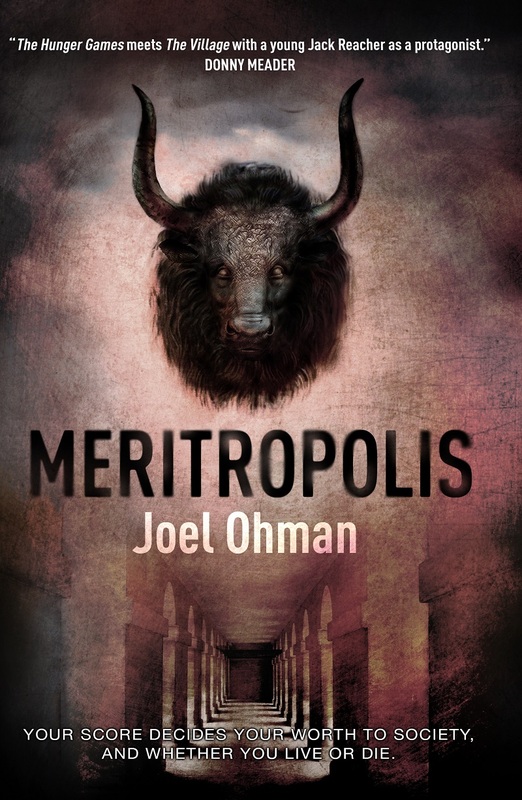 I read A LOT so there are many different things that have shaped my writing over the years, but I wouldn’t say there was any particular book, or books, that I was consciously looking to for inspiration while writing Meritropolis. Looking back though I can definitely see different threads of influence in almost everything I have read over the years that contribute toward making Meritropolis what it is: the strong protagonist of Lee Child’s Jack Reacher series, the philosophical bent of C.S. Lewis’ fiction, the dystopian setting of Hugh Howey’s WOOL series, and many more. Are there any authors that have emerged in the last three years that have caught your interest? Hugh Howey is an author that I really like that has caught my attention lately. I would highly recommend his WOOL series! Meritropolis is marked down from its regular price of $5.99, but only for a limited time. Feed your Kindle by picking up a discounted copy for just 99 cents, but make sure you do it before December 2! When people started getting sick, “they” thought it was just the flu. My roommate, my boyfriend, my family…they’re all gone now. I got sick too. I should have died with them–with the rest of the world–but I didn’t. I thought witnessing the human population almost disappear off the face of the earth was the craziest thing I’d ever experience. I was so wrong. My name is Dani O’Connor, I’m twenty-six-years-old, and I survived The Ending. The Virus changed everything. The world I knew is gone, and life is backwards. We’ve all had to start over. I’ve been stripped of my home, my dreams…all that is me. I’m someone else now–broken and changed. Other survivors’ memories and emotions haunt me. They invade my mind until I can no longer separate them from my own. I won’t let them consume me. I can’t. 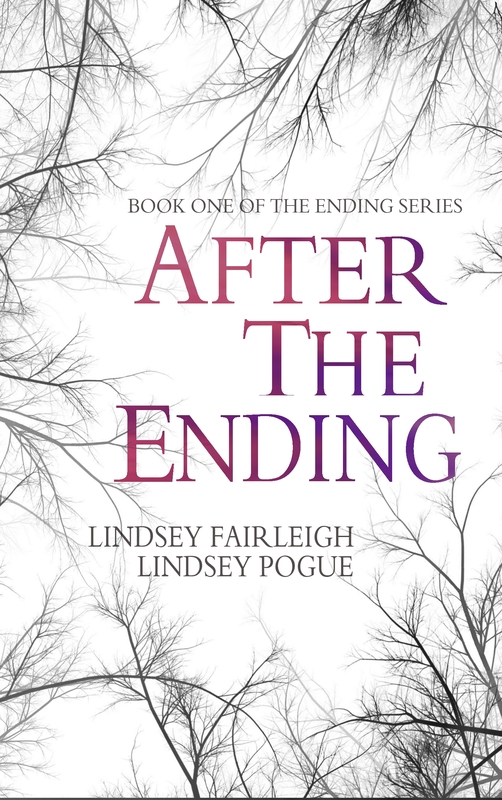 My name is Zoe Cartwright, I’m twenty-six-years-old, and I survived The Ending. We’ve been inseparable for most of our lives, and now our friendship is all we have left. The aftermath of the Virus has stranded us on opposite sides of the United States. Trusting strangers, making sacrifices, killing–we’ll do anything to reach one another. Fear and pain may be unavoidable, but we’re strong…we’re survivors. But to continue surviving in this unfamiliar world plagued by Crazies and strange new abilities, we have to adapt. We have to evolve. And more than anything, we have to find each other. About the book: Maggie met Cooper at a young age, but even then she sensed something was wrong with him. His charm, good looks, and wealth could not hide the danger that burned in his sapphire eyes. Some nightmares don’t go away. He’d been haunting her from a distance for as long as she could remember. When her sons Jack and Tom discover she’s been taken, they set out to rescue her and uncover nefarious family secrets, explosive government conspiracies, and a series of horrific murders along the way. Only their colorful great aunt and a covert resistance group can help them navigate the dark underworld full of political subterfuge and class warfare. All the while, Maggie struggles to outwit her tormentor in a life and death psychological battle of tense desperation. Will Jack and Tom arrive before Cooper reaches his shatter point? Reader’s Favorite has given Shatter Point two 5 Star Reviews! About the prizes: Who doesn’t love prizes? You could win a $15.00 gift cards to Amazon or Barnes & Noble, or an autographed copy of Shatter Point! About the author: Jeff Altabef lives in New York with his wife, two daughters, and Charlie the dog. He spends time volunteering at the writing center in the local community college. After years of being accused of “telling stories,” he thought he would make it official. He writes in both the thriller and young adult genres. Fourteenth Colony, a political thriller, is his debut novel. Jeff has a blog designed to encourage writing by those that like telling stories. You can find his blog, The Accidental Writers Workshop, on The Patch. Connect with Jeff on his website, Facebook, Twitter,or GoodReads. I’m a killer. No better than a common murderer, and worse, really. More like a serial killer who can’t help himself as he takes life after life, unable to stop even if he wished he could. Darian frowned at the corpse on the stainless steel autopsy table. “Damn it, Zeus, I thought you were going to make it.” His frown deepened until long lines etched into his face. Remorse wasn’t good enough. It was useless. Pointless, really. Remorse would not bring Zeus or any of the others back. He glanced at the video projections of Zeus’s brain development. His original brain on the left screen appeared normally formed and perfectly functional. The one on the right showed Zeus’s brain after he had injected him. Misshapen and grotesque, it was so overdeveloped it strained against the skull. “We’re making progress, Doctor Beck. This time, the brain enlargement slowed at the end. With some adjustments, next time it might stop before….” George attempted to smile, but only the tips of his lips responded. Twice Darian’s age, he was so optimistic he could see the silver lining in a hurricane, but this lethal turn of events left even him speechless. “We’re missing something critical. We need to stop the brain development before it overwhelms the subject.” Darian peered through the glass wall that separated the autopsy room from the rest of the laboratory. The remaining five subjects sat perfectly straight and stared mournfully at the glass as if Darian and Zeus and the table with death hovering above it drew their gaze. An icy chill tickled its way up his spine. The others had no idea Zeus had died. They were often separated. To them, the glass wall was a simple mirror. They had no idea—could have no idea—a laboratory sat beyond the glass, yet he suspected they knew the truth: that Zeus was dead and he the killer. George handed him the shiny autopsy tool, but before he switched it on, the lab door swung open and Brenda Callaghan darted into the room. The normally composed, rather attractive young researcher appeared ashen, her jaw clenched tight. Our team at Clean Teen Publishing and Crimson Tree Publishing has a big reason to celebrate! We just signed our 65th Title! That’s big news for our company after just celebrating our one-year anniversary a few months back. To celebrate, we are giving away not one, but two $65 Amazon Gift Cards (or Paypal Cash)! We decided one wasn’t enough so Clean Teen Publishing will be giving away one and Crimson Tree Publishing is giving away the other. Now it’s time to enter the giveaway! This giveaway runs through September 30 2014. Good Luck! How important do you think cover art is to selling your books? For self-published and small house published authors, what do think is important to remember when deciding on the final cover for your work? I stand firmly on the side advocating book covers that support the central themes of the story they contain. For literary fiction, you can get away with more creative (or minimalist) covers that don’t have much to do with the story itself but are artful and visually compelling. But for fantasy and other genre fiction, covers should capture a particular feeling that’s prevalent in the story (loneliness, peril, mystery, love, longing…) and give the reader some sense of the world. No matter your genre, ensure your cover communicates the things you need and want it to communicate, and don’t settle for anything less. The cover is your first communication to a potential reader. Make sure the communication you want is what gets across to them. Who did you choose to use for cover art, and why? What was your process for deciding on who to use? With the original covers for Cephrael’s Hand and The Dagger of Adendigaeth, I used an independent digital artist, Kentaro Kanamoto, to create the artwork, and then I designed the covers around the artwork. The new covers were produced by Damonza.com. I really liked their approach to cover design and was attracted to them originally when I saw a cover they produced for another independent author. They ask for a lot of information about the story and its central themes up front, and then they get busy creating. They worked with me through a number of revisions until I was happy with the covers. How does the new cover better relate to the book and its characters? It was important to me to ensure that the new covers give a sense of the world as well as some of the story’s key thematic elements. All three of the new book covers give a visual representation of more themes that are central to their part of the story. Cephrael’s Hand is the name of a constellation that features prominently in book one, so of course those stars are represented on the cover. Patterning is the name of the magic system in the world, and some representation of Patterning is included on all of my new covers. For the cover of Cephrael’s Hand, the most central character in the story is working a pattern. This was important to me, as I feel having that image there helps establish a visual concept of Patterning for the reader early on in the series. 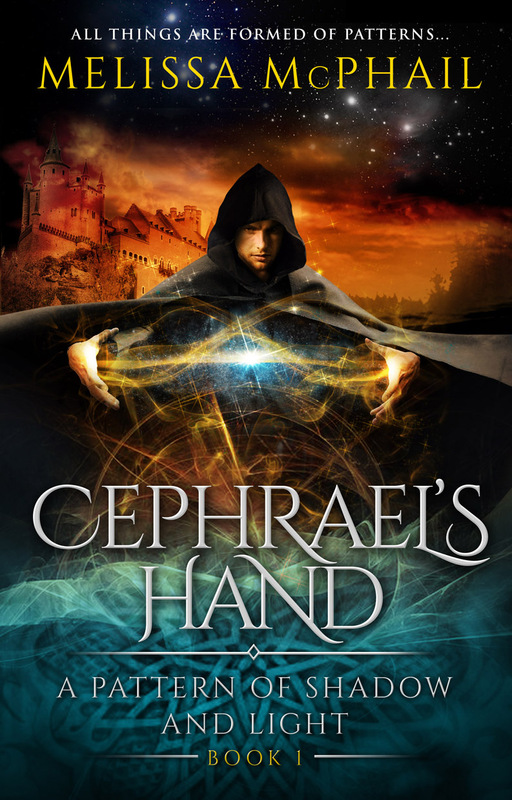 The new Cephrael’s Hand cover also gives a sense of the time period and setting of the story. Can we expect similar covers for the rest of the series? Yes. I decided to rebrand the entire series with new covers. Having all of the books similarly branded as part of the same series is important for continuity and will help readers from becoming confused. The covers also help establish a growing concept of the world as the story grows. Interestingly, I debated rebranding the earlier books, since ideally once your readers are heading into the second or third books, they’re already committed to your series. It brooked the question if book covers were still that important later in a series. But as I looked at this topic, I saw that you never know at what point a reader will come across your books. Too, it isn’t always the first book that grabs their attention. So great covers are a must for every book. Speaking of the series, when will books 2 and 3 be available? Book two, The Dagger of Adendigaeth, was released in 2012, and book three, Paths of Alir, will be available in October 2014. Are you ready for the reveal of the new Cephrael’s Hand cover? Because here it is! What do you think? 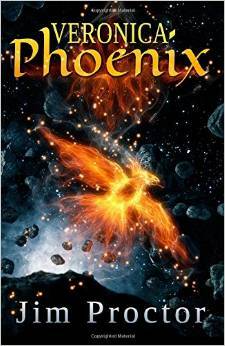 Does it do a good job conveying the fantasy genre? Is it a book you’d be attracted to in the store? Does it make you want to learn more? Thank you for helping us celebrate! If you’d like to see the new covers for books 2 and 3 in the series stop by www.MelissaMcPhail.com, and check them out. Guess what else? 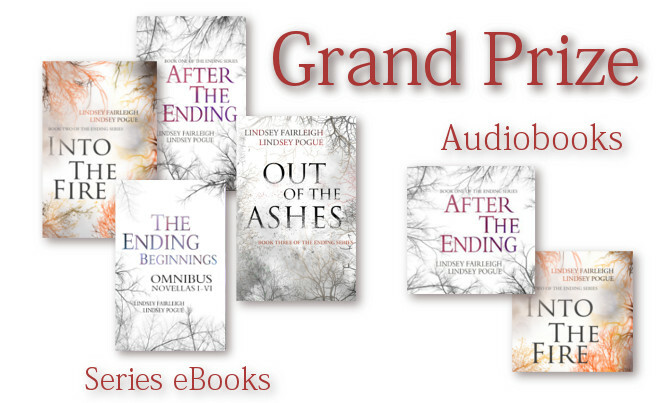 The author is offering a special giveaway as part of this grand event. Check out the Rafflecopter form below (it’s also available at www.novelpublicity.com/cephrael-cover-reveal/) to find out how you can win a Kindle Fire. Hooray! Oh, and don’t miss learning more about Cephrael’s Hand and where you can pick up a copy—that’s below too. In Alorin… three hundred years after the genocidal Adept Wars, the realm is dying, and the blessed Adept race dies with it. One man holds the secret to reverting this decline: Bjorn van Gelderan, a dangerous and enigmatic man whose shocking betrayal three centuries past earned him a traitor’s brand. It is the Adept Vestal Raine D’Lacourte’s mission to learn what Bjorn knows in the hope of salvaging his race. But first he’ll have to find him. In the kingdom of Dannym… the young Prince Ean val Lorian faces a tenuous future as the last living heir to the coveted Eagle Throne. 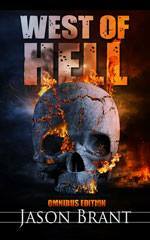 When his blood-brother is slain during a failed assassination, Ean embarks on a desperate hunt for the man responsible. Yet his advisors have their own agendas, and his quest for vengeance leads him ever deeper into a sinuous plot masterminded by a mysterious and powerful man, the one they call First Lord. In the Nadori desert…tormented by the missing pieces of his life, a soldier named Trell heads off to uncover the truth of his shadowed past. But when disaster places him in the debt of Wildlings sworn to the First Lord, Trell begins to suspect a deadlier, darker secret motivating them. Honor-bound to serve the First Lord in return for his life, Trell continues on his appointed path, yet each day unveils new and stranger secrets that eventually call into question everything he knows. Get it on Amazon, Barnes & Noble, or wherever awesome eBooks are sold!